Many of you have read about Miss Baby’s crafting adventures on this blog. 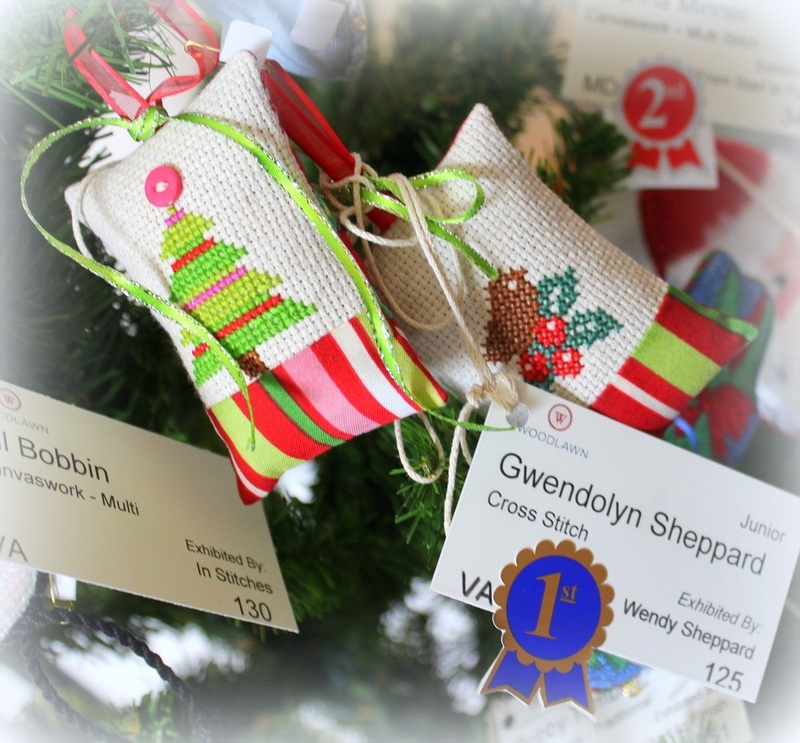 Her most recently completed work are two Christmas ornaments she stitched for Christmas last year. You may click here to read more about the ornaments. We are very excited our very own Miss Baby won a First Place ribbon with her entries in the Junior Category. Well, Miss Baby was a bit bummed out there wasn’t a real ribbon on there for now…. “only a ribbon sticker!” She was assured she WILL get her real ribbon when we pick up the ornaments. Photography was limited to entrants taking snapshots of their entries only. So I have no pictures of the other entires. They were all inspiring, and I actually thought about moving into a cave to get caught up with my own stitching. :) I was most heartened to see the joy of needle and thread possibly continuing in my family. Martha Washington was a quilter and stitcher as well. 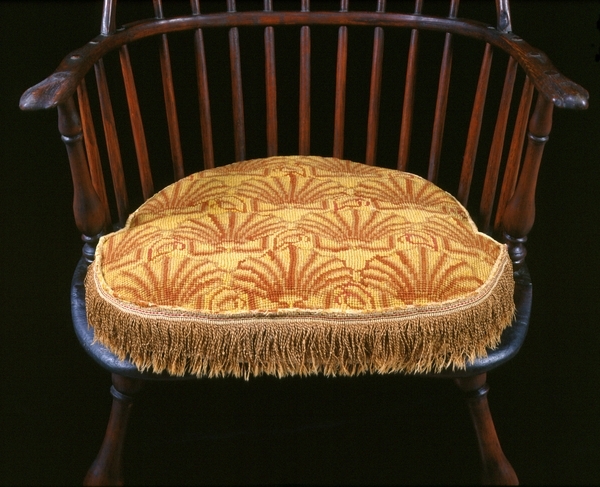 She famously stitched the seat cushions for some of the chairs at Mount Vernon. Click here to read more about Mrs. Washington’s needle and thread adventures. My armchair historian’s view is that Nelly Lewis, who grew up at Mount Vernon, could have very well learned to stitch at her grandmother’s tutelage. Thank you again for stopping by. Have a great week ahead! This entry was posted in Needlework and tagged 2015 Woodlawn Needlework Exhibit. Bookmark the permalink. Sob Sob!! I am the only girl in our little family. The wife and girlfriend are not into sewing (although they are very happy for me to sew for them!?!) I am planning on teaching my little grandson one day. Trouble is he is a boyish boy – cars, trains, planes etc so I may be in for disappointment! How absolutely wonderful! Miss Baby has definitely inherited your passion and needlecraft skills, Wendy, and I can understand what a proud Mummy moment this is. Please give Miss Baby (Gwendolyn) my hearty congratulations. I look forward to seeing more of her exquisite handwork. Copngrats to Miss Baby! I’m afraid if I won I would want my ribbon right then as well! 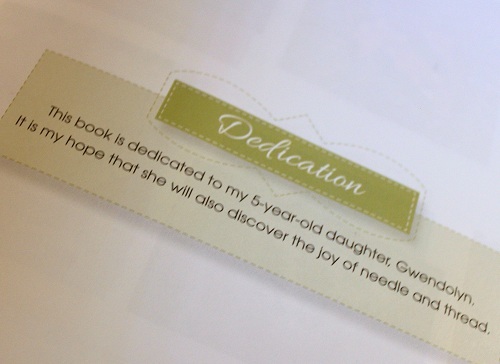 So happy for you that you have a stitcher in your family to carry on the love of the needle and thread. Can’t wait to sew with you in Rogers. Congratulations to Miss Baby! How wonderfully encouraging for her to keep on stitching! Thank you for the history too! 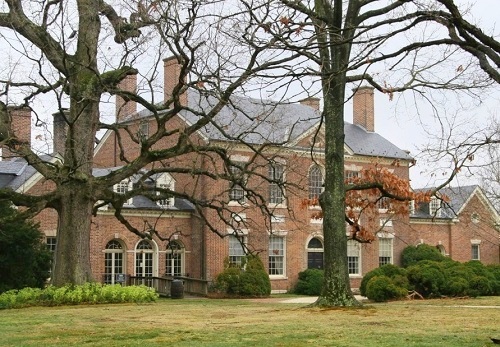 I sure would like to pay a visit to this Nelly’s mansion someday. Congrats to Miss BAby! Way to go! My g/dau was here all last week during spring break and she put some charms together and called it Rainbow, no batting, just backed and turned and a big X from corner to corner to hold it together. Her first time using a machine. Very good job! I did the border and backing for her. She is only 8. What a wonderful legacy for your daughter! I know you must be proud of her. Entering any kind of contest can be a bit scary to have your workmanship judged. She does beautiful work. Winning a ribbon will certainly provide encouragement to continue to create. Wendy…you are so proud of your daughter! Keep encouraging her, the ornaments are beautiful! Congratulations to Miss Baby. These ornaments were really beautiful. She gets her inspiration and eagerness from YOU, that is certain. Congratulations to your daughter!!! I hope and think this boost and recognition of her talent will keep her stitching more beautiful things. I have a granddaughter but unfortunately, she takes after her mother rather than her father, my son, who has always loved to create things with his hands. Zero interest for both those gals. My Mom and I had a great relationship that included our love of stitching. Funny how that never rubbed off on my sister though! The stitching gene is either there or not. :-) So happy your daughter has it! First….Congratulations to your daughter! Second….I loved your historical review. Both were a pleasure to review wrapped around your story. Nancy K.
Congrats to Miss Baby. She has to be over the moon winning her first prestigious ribbon. Wendy, you have been a wonderful inspiration to her and, actually, to many of us. You will have a forever bond with her, stitching will be shared between the two of you forever. I’m so very proud of Miss Baby. Big Congratulations. And I’m proud of you for teaching her such skills as they will carry with her, her entire lifetime. And, of course, I always enjoy your historical insights. Congratulations to Little Miss Gwendolyn. Her work is wonderful and reflects a kind and patience mom who takes the time and effort to encourage her daughter. So really this is congratulations to you both! How exciting for Miss Baby … and for you, her proud mother! She did a fabulous job on those two ornaments. I wonder what’s next from her needle. Congratulations to Miss Baby! WTG Gwen! How exciting for her! Congratulations Miss Gwendolyn! How exciting for her and for you too! 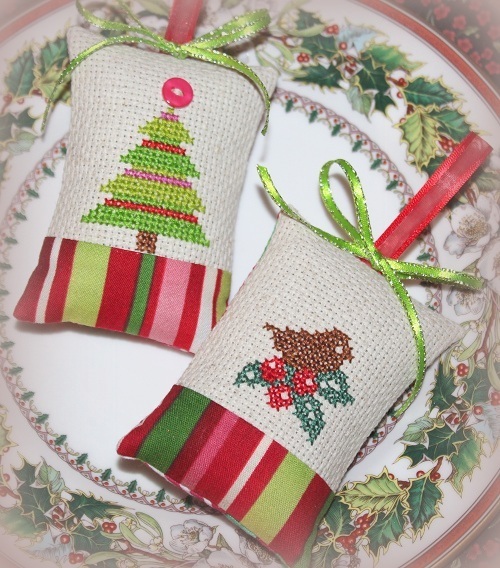 Her cross-stitch ornaments are beautiful. It’s wonderful to see the needlearts being passed along to future generations. But for me, it was my daughter who got me interested in quilting. How about that? Congratulations Miss Gwendolyn!! What beautiful heirlooms for her. It will be exciting what other crafty things she will be interested in as she grows up. congratulations to your talented and inspired daughter-you must be such a proud mum just now. Congratulations to Miss Baby! That IS exciting! I would love to visit that needlework show! I wonder how far that is from here…will have to look it up. :-) Neat to see a heritage of stitchery carrying on. Congratulations, G! That’s wonderful. I’m sure you’ll be earning many more ribbons along the way. Great job! What fun! Congratulations to Miss Baby for her accomplishment and ribbon! Such a lovely post. Thank you for sharing family achievements. Congratulations to Miss Baby for a beautiful job. She has talent and patience!! Thanks Mom (Wendy) for guiding her in this lifelong stitching adventure. I’m with Miss Baby, we want the ribbon, not a paper sticker! !